Maggie Sheehy, MD, MSc, views running the 2018 Boston Marathon as a once-in-a-lifetime opportunity. Although work and study have made it tough for Maggie Sheehy, MD, to find adequate training time, the emergency physician can't wait to run the 2018 Boston Marathon for Mass General. Maggie Sheehy, MD, MSc, doesn’t have much free time to train for the 2018 Boston Marathon. Her schedule as an emergency physician and a Global Health Innovations and Leadership Fellow at Massachusetts General Hospital keeps her busy. Dr. Sheehy alternates clinical work in the Mass General Emergency Department with coursework toward a master’s degree in public health at Harvard University. On top of that, she travels the globe for sustainable development projects, including a recent trip to Puerto Rico to help victims of Hurricane Maria. Maggie Sheehy, MD, MSc, says she will be fueled by enthusiasm when the starter’s gun sounds for the 2018 Boston Marathon. Still, despite the constant pace of work keeping her from logging sufficient training miles, Dr. Sheehy can’t wait to run as a member of Mass General’s Emergency Response Marathon Team. The team raises money to support the hospital’s emergency care and disaster relief and preparedness efforts. Dr. Sheehy can attest to the value of those services. “At Mass General, we take emergency planning very seriously,” Dr. Sheehy says. “Preparing for the next disaster takes much training and practice.” Because such training is not covered by insurance, donors’ financial support helps Dr. Sheehy and other emergency response team members stay fully prepared for the next disaster. Dr. Sheehy, 32, envisions a career in medical education, with the aim of furthering global emergency medicine and response. She saw the rewards of helping a calamity-stricken populace when she and 25 other Mass General medical professionals flew to Puerto Rico in 2017 after Hurricane Maria. In all, more than 50 disaster response professionals from Mass General and Partners HealthCare provided assistance to residents of Puerto Rico, the Virgin Islands, Florida and Texas after the series of hurricanes that struck the U.S. and its territories in 2017. Dr. Sheehy and her fellow responders worked at a medical shelter in Ponce, a coastal city in south Puerto Rico. They assumed responsibility for 22 displaced senior citizens who needed basic care. The senior citizens couldn’t yet return home, and lacked the financial means to seek refuge on the U.S. mainland, as many residents did. For 16 days, the Mass General responders took care of the displaced while working closely with non-governmental organizations to find them places to live. The responders had to ensure the seniors would return to clean homes with working appliances, as well as have money to purchase the gasoline needed to run power generators. Ultimately, most of the displaced went back to restored homes. A year into her fellowship at Mass General, Dr. Sheehy is impressed by the professionalism and skills of the Emergency Department’s doctors, nurses and staffers. She’s equally amazed by the hospital’s deep well of resources, including its social workers and addiction counselors. Everyone works together to provide acute care and help patients with long-term issues like drug and alcohol addiction, she says. When her fellowship ends this year, Dr. Sheehy, her husband and their one-year-old daughter will return to their home state of Nebraska. She will work there as an emergency physician. Dr. Sheehy “grew up in what some people would call the middle of nowhere,” she says of her hometown, Hastings. The land is flat, and she hasn’t consistently run on hills like those found on the Boston Marathon route. Her last marathon was 10 years ago, in Lincoln, Nebraska. 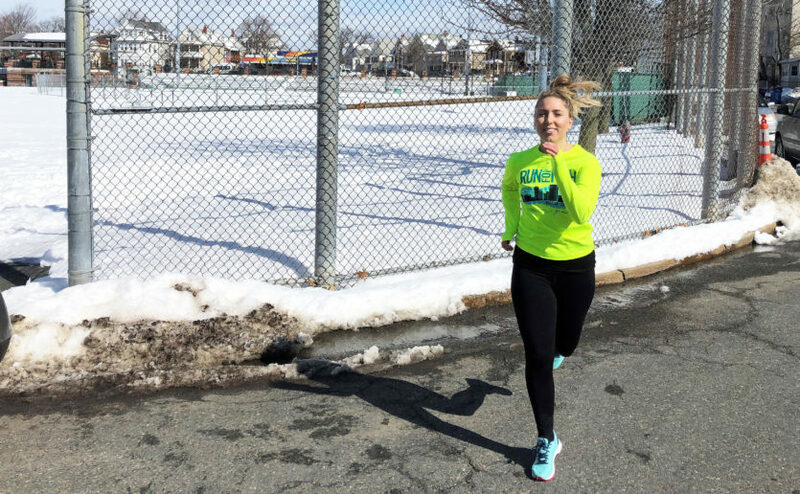 Despite only being able to train infrequently for the 2018 Boston Marathon, she says she will be fueled by enthusiasm when the starter’s gun sounds. Please consider supporting Dr. Sheehy and other runners raising money for Mass General’s emergency response efforts.